Visitors line up to buy a blooming onion during Onion Fest at Mayor Pablo G. Peña Park Saturday, March 24, 2018, in Weslaco. 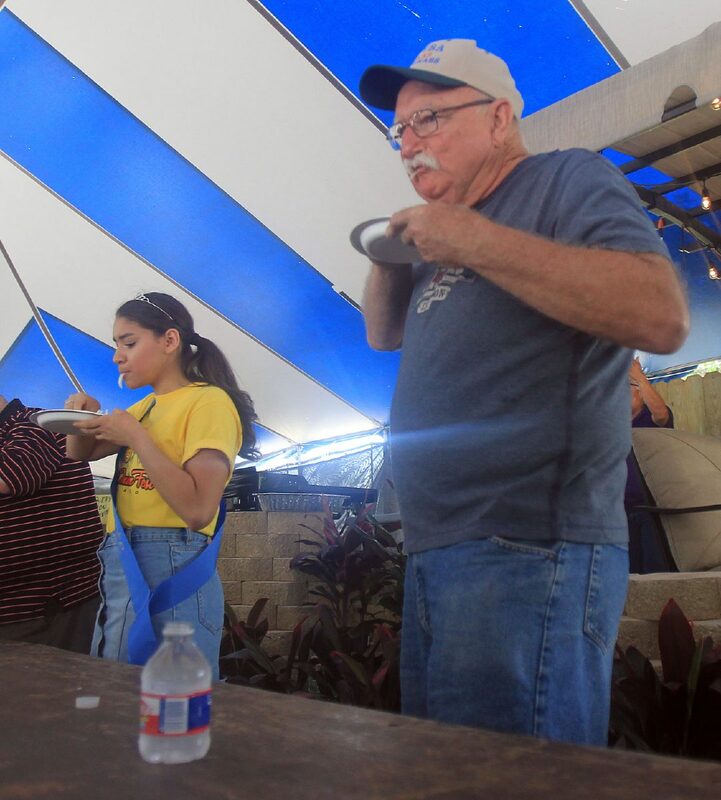 WESLACO — As the temperatures rose to the upper 80s Saturday, an audience of about 50 people gathered under the blue-and-white-striped Frost Bank tent to witness the onion-eating competition during the 2018 Texas Onion Fest. The annual contest is open to anyone brave enough to dive into eating raw onions within the allotted time. Two tables were laid out under the tent for the contestants to take their places as volunteers placed the sliced, raw onions onto paper plates before the competition began. The contest was divided into three preliminary rounds with six participants each with the winners moving on to a fourth final round that determined the grand champion following the last bite. Jim Campion, right, competes in the onion-eating contest during the Texas Onion Fest at Mayor Pablo G. Peña Park Saturday, March 24, 2018, in Weslaco. 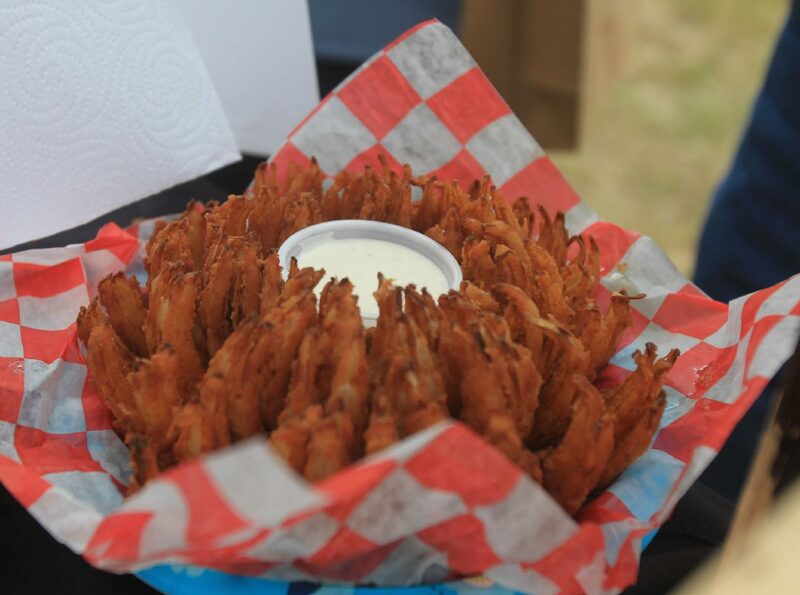 A blooming onion is ready to eat during the Texas Onion Fest at Mayor Pablo G. Peña Park on Saturday, March 24, 2018, in Weslaco. John Billman creates a blooming onion during the Texas Onion Fest at Mayor Pablo G. Peña Park on Saturday, March 24, 2018, in Weslaco. 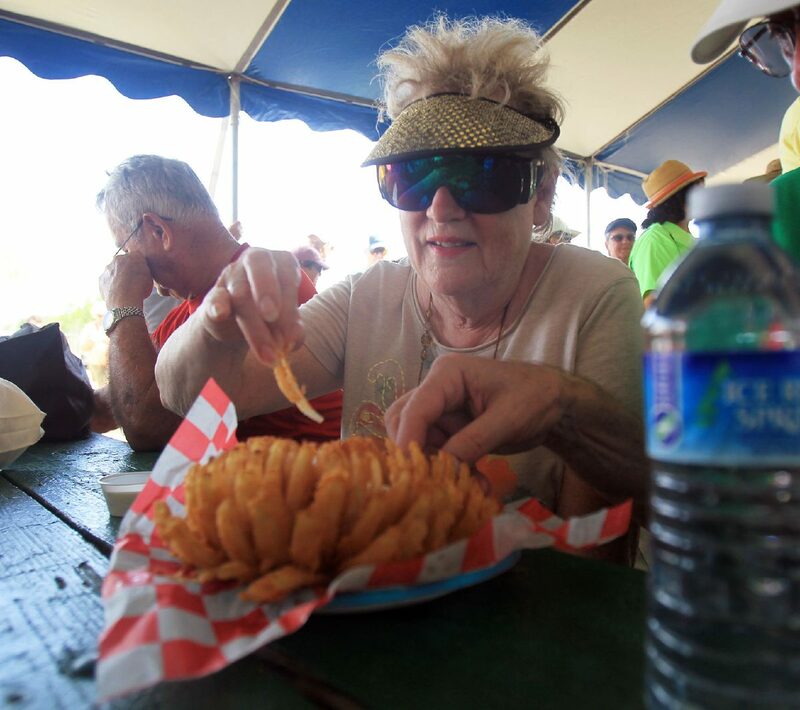 Mary Lou Perkins enjoys a blooming onion during the Texas Onion Fest at Mayor Pablo G. Peña Park on Saturday, March 24, 2018, in Weslaco. The first round was made up of five men and one woman ready to attack the plate of raw onions. Some contestants alternated eating a bite of the onion with a sip of water, while others attacked the onions by the handful and drank the water afterward. The first-round winner was James Campion, a native of Minnesota and a first-time visitor to the Rio Grande Valley. The second round was made up of young ladies from the Texas Onion Fest pageant which was held in January. Not all were able to keep eating the onions without squirming trying to finish. Danielle Silva of Weslaco, the Miss Texas Onion Fest first alternate, won the second round. The third round was all men who stood ready to clobber down the raw onions. The winner was Henry Miller of McAllen. For the finale, the three preliminary round winners were called back to compete for the top prize, which included a trophy and a $50 Red Lobster gift card. The second and third place winners also received gift cards to local restaurants. When the time expired, Campion was declared the winner. He joked that he only entered the contest because his wife told him to do it. “I love onions and these are some really good onions,” he said about the contest and the festival. He added that he hopes to return for years to come. Silva, a student at Weslaco High School, said eating the onions was hard since she is not really a fan of onions. Another competitor, Laryssa Garcia, 2018 Miss Weslaco and a student at Weslaco East High School, said she too is not normally a fan of onions, but she went into the contest optimistic and hoping not to get grossed out. 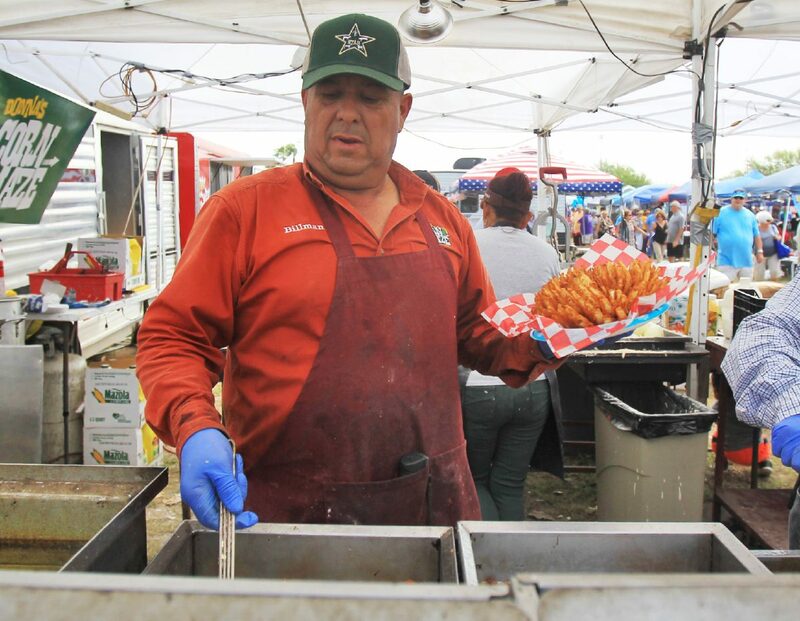 The raw onions served were 1015 Texas Sweet Onions which are celebrated each year during the Weslaco festival. It was here that the famous onions were developed. They take their name from the Oct. 15 planting date. It also happens to be the state’s leading vegetable crop and became the official state vegetable in 1997. Most attendees at the festival weren’t drawn there by the prospect of eating raw onions. They were there for the famous blooming onions sold by vendors. 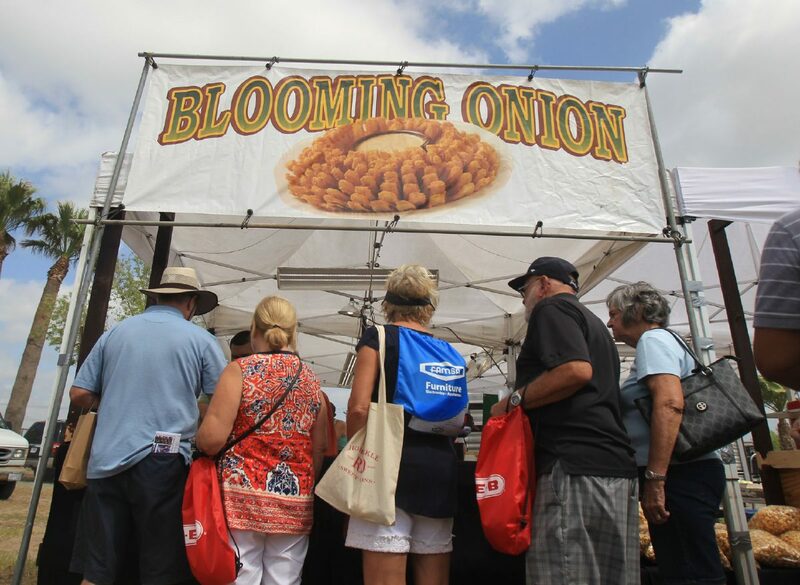 The breaded, fried onions served with a dipping sauce are always a huge draw for the festival that also featured musical entertainment and kid-friendly activities.